On Wednesday 25th July, myself and nine others had the pleasure of travelling to Beamish with Reays Coaches. 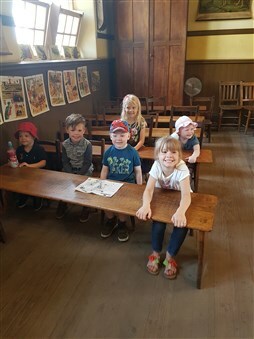 Having never visited Beamish before I was unsure what to expect, but it had been highly recommended to me and I was keen to see what the world-famous open air museum, telling the life of life in North East England had to offer. 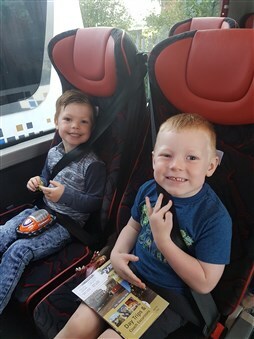 Following an 8am departure we travelled over to County Durham in comfort on a brand new 53-seater Temsa, arriving in good time to spend the day exploring. We started our day in the 1900s Town where we seen first hand how families lived and worked in the years leading up to the First World War. From there it was down to the 1900s Pit Village, where we explored the terrace of miners cottages - No.2 the Methodist familys home, No.3 housed a family of Irish descent, No.4 home to a widow who lost her husband in a pit accident, and the Colliery Pay Office at the end. It was fantastic to see and show our children how times used to be versus todays modern world. From here and one of the many highlights of the day for the children in tow in our group was the school where we got to write with slate on a blackboard before trying out some historic playground games. No recreation of the history of North East England would be complete without a colliery and the people who worked there. This we were able to experience for ourselves as we headed deep into the drift mine for our guided tour. Our guide talked passionately about the generations of families who worked down the North East pits as we learned how children as young as 14 would work underground in pitch black darkness, only guided by a small lantern. Once back out into the light of day, we decided to take a trip to the farm and lighten the mood somewhat. 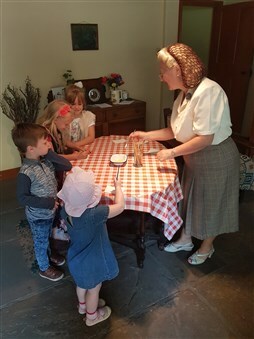 The children loved learning how life was on the home front during the Second World War and the importance of farms in this era and the roles women played. From chickens to pigs, horses to tractors there was so much to see. My mum particularly enjoyed the traditional kitchen complete with utensils and a historic Be-Ro recipe book! The transport showcased at Beamish throughout the whole site was superb. At Rowley station the variety of wagons on display were excellent, while the opportunity to ride on the Edwardian open air buses and along the tram line utilising the tram service which re-created the experience and atmosphere of tramway operation of an earlier generation had our kids screaming in delight. As well as the many different areas to explore, Beamish hosted a variety of open stores with traditional actors in place at the tea rooms, bakery and sweet shop, to name but a few. Lots of gift shops and eateries meant we were never short of anything to do or see. Keeping the kids entertained during the school Summer holidays is never easy but this trip was superb as well as being educational. The children in our group ranged from age 2 to 10 and were fully entertained throughout the day. At 5pm we re-joined our coach for the journey home, arriving locally around 8pm after a fantastic day out for all the family which I would highly recommend to others. Travelling in comfort with Reays Coaches. Back to school for this bunch. Experiencing writing secret messages with lemon juice.